Madison Square Garden Entertainment and Hear the Music Live Dazzle West Coast Foster Children and Teens by the Radio City Christmas Spectacular! Hear the Music Live and Madison Square Garden Entertainment send foster children and teens throughout the West coast to Radio City Christmas Spectacular. 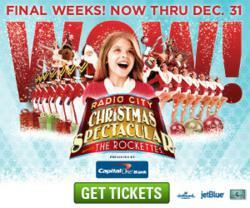 Children and teens in foster care in Oakland, Fresno, San Jose, Sacramento, Bakersfiels, Portland and Boise receive free tickets to be dazzled by the Rockettes in the Radio City Christmas Spectacular currently touring the West coast. “As you probably know our kids in foster care normally do not attend this sort of thing and it is a big boost to their self-esteem to get to do so. In fact, they suffer from what I call a "poverty of experience"
National non-profit organization, Hear the Music Live teams up with Madison Square Garden Entertainment (MSGE) to send deserving foster children to be amazed by the Radio City Christmas Spectacular tour on the West coast. Foster families are able to delight in this beloved holiday tradition in several locations throughout California such as San Jose, Sacramento, Oakland, Fresno and Bakersfield. Foster families in Portland, OR and Boise, ID will also be thrilled by the Radio City Christmas Spectacular courtesy of MSGE and Hear the Music Live. Hear the Music Live is a national 501 (c)(3) non-profit that provides live music experiences for foster youth and teens throughout the United States and Canada. Hear the Music Live is the vision of our founder, Steven Nornhold who has a life-long passion for music and understands that some teens are missing out on some opportunities that many others take for granted. Since 2009, Hear the Music Live has sent close to 3,000 foster children, teens and families to concerts in their local area. Hear the Music Live and MSGE understand that youth and teens in foster care homes or orphanages may not have the opportunity to enjoy activities that other children are experiencing. By joining together this holiday season, foster children and teens are able to access the magic of the wildly popular Radio City Christmas Spectacular. The Radio City Christmas Spectacular West coast production was specifically designed for large-scale venues and replicates on a grand scale the exact production of The Christmas Spectacular at Radio City Music Hall. Audiences are taken on a theatrical journey that the entire family can enjoy together. By joining forces with Hear the Music Live, West coast foster children thrill as Santa takes the audience on a magical sleigh ride to the North Pole, while foster parents and caseworkers marvel at the unparalleled precision dance of the Radio City Rockettes. The Christmas Spectacular is truly unique in its universal appeal to people of all ages. This dazzling holiday production is guaranteed to bring smiles to foster families and help create wonderful memories for foster children that will last a lifetime. Foster children and teens who attend the Radio City Christmas Spectacular courtesy of Hear the Music Live and MSGE will be amazed by show-stopping Rockette numbers, dazzling costumes, dramatic arena lighting effects; breathtaking imagery; and festive musical compositions. The production is enhanced by an immense LED screen that transports the audience from a wintry landscape to Times Square to Santa’s Workshop right before their very eyes. The larger than life sets and awe-inspiring special effects allow foster families to connect with both the intimacy and grandness of The Christmas Spectacular as they are immersed in the warmth and grandeur of the holiday spirit. From the moment guests settle into their seats, the audience becomes part of the Spectacular’s magical experience. Fan-favorites like the legendary “Parade of the Wooden Soldiers,” which continues to set the standard as the signature Rockette number for precision performance, and the “Living Nativity” remain a vital part of the show’s core. And the Rockettes will undoubtedly bring the audience to their feet with a Rockette finale “Let Christmas Shine,” which honors and celebrates the Rockettes as the stars of the show. The Rockettes are an American treasure and their performance style has always been both entirely glamorous and deceivingly complex. As the stars of the legendary Christmas Spectacular, the Rockettes move this new production forward as they showcase their signature precision dance style and debut some of the most challenging and freshest Rockette numbers that have ever been conceived. “As you probably know our kids in foster care normally do not attend this sort of thing and it is a big boost to their self-esteem to get to do so. In fact, they suffer from what I call a "poverty of experience" and being able to attend a concert of this magnitude greatly adds to their bank of experience.-Caseworker, Portland, OR"
Hear the Music Live would not have been able to spread the pure joy which is the Radio City Christmas Spectacular if it were not for the efforts of Cindy Eska from MSG Entertainment who took a real interest in their mission to provide concert experiences for foster youth and teens nationwide. Hear the Music Live is very grateful and would like to thank Cindy Eska and MSGE for brightening lives and making dreams come true for foster children this holiday season. Hear the Music Live is a non-profit organization that works with foster care homes and orphanages to send pre-teens and teens to concerts in their local area and provide them the opportunity to do "meet and greets" with the artists. For further information on how you can brighten the lives of foster children this holiday season and in the future, please visit http://www.hearthemusiclive.org. Further information concerning upcoming events, ticket giveaways, ways to donate and volunteer can also be accessed by visiting their Facebook page. Please direct any questions or ideas to aimee_white at hearthemusiclive dot com. Hear the Music Live is a national 501 (c) (3) non-profit devoted to providing live concert experiences for foster youth and teens nationwide.